Got this bad boy for Christmas. It's a Brooks B66 for my 1971 Raleigh Superbe. 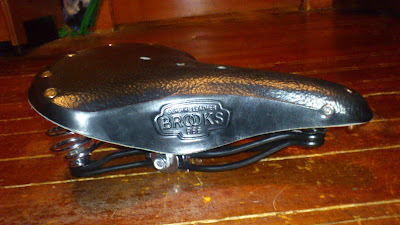 It came with an old Brooks padded saddle that was pretty comfortable but split pretty quickly after I got it. When that happened I scored a Brooks Flyer from my local bike shop. Was pretty happy with the deal, half price, which wasn't much more than the padded saddle I was going to buy. Was quite happy with that saddle but I found it a little too hard for the upright riding position of the Superbe. When I got my Fuji S12-S I put the Flyer on that bike as it seemed a better fit, leaving the Superbe saddleless. Right now it's got the lousy hard Avocet saddle that came on the Fuji. The folks got this for me for Christmas. The only problem is I don't want to take the Superbe out in the salt and slush so I can't try it out until at least mid March. Oh Christmas, why can't you be better timed for biking season?